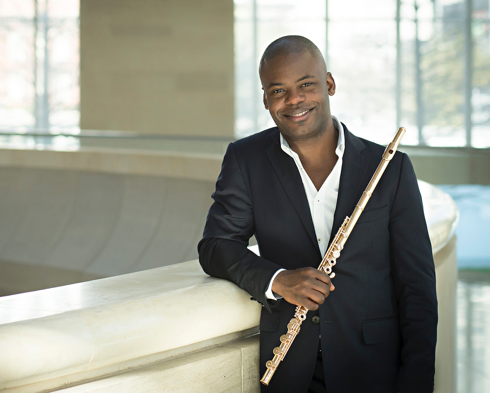 Winner of the prestigious Avery Fisher Career Grant, flutist Demarre McGill is acclaimed for his “richly saturated tone, spirited technique, and expressive warmth” and has quickly become one of the most sought-after flutists of his generation. He enjoys an active career as a leading soloist, recitalist, artistic director, and chamber musician. McGill has appeared as soloist with the Chicago Symphony, Philadelphia Orchestra, Pittsburgh Symphony, San Diego Symphony, Baltimore Symphony, Milwaukee Symphony, and Buffalo Philharmonic, among others. An active chamber musician, McGill appears regularly throughout the United States and abroad. He is a founding member of The Myriad Trio and has participated in many national and international chamber music festivals, including the Santa Fe Chamber Music Festival, [email protected], Marlboro Music, La Jolla Music Festival, and Music from Angel Fire, to name a few. International festivals include the Stellenbosch Chamber Music Festival in South Africa, St. Bart’s Music Festival in the Caribbean, and the Jeju International Wind Ensemble Festival in South Korea. He has been a member of the Ritz Chamber Players and Chamber Music Society Two, the Chamber Music Society of Lincoln Center’s program for emerging young artists. In addition to his performance schedule, McGill is the co-founder and Artistic Director of Art of Élan, a chamber music organization in San Diego that aims to expose new audiences to classical music. His discography includes Bach’s Brandenburg Concerto No. 5 on the album Play Bach with pianist Awadagin Pratt and the St. Lawrence String Quartet (Angel Records), as well as a flute, viola & harp album entitled The Eye of Night with The Myriad Trio. McGill’s media credits include appearances on PBS’s Live From Lincoln Center with the Chamber Music Society playing Bach’s Brandenburg Concerto No. 2, A&E Network’s The Gifted Ones, NBC’s Today show and Nightly News, and as a teenager, Mr. Roger’s Neighborhood. Appointed Principal Flute of the Dallas Symphony in June 2013, he previously served as Principal Flute of the Seattle Symphony for two seasons and held the same position with the San Diego Symphony, Florida Orchestra and Santa Fe Opera Orchestra. He also served as Acting Principal Flutist of the Pittsburgh Symphony during the 2005-06 season. A native of Chicago, McGill began playing the flute at age seven and his family is steeped in the performing arts. In May of 2012 McGill and his brother, Anthony McGill, Principal Clarinet of the New York Philharmonic, performed the world premiere of Joel Puckett’s Concerto Duo for Flute and Clarinet with the Chicago Youth Symphony Orchestra, the orchestra where they began their careers. His mother is a theater actress in the Chicago area. 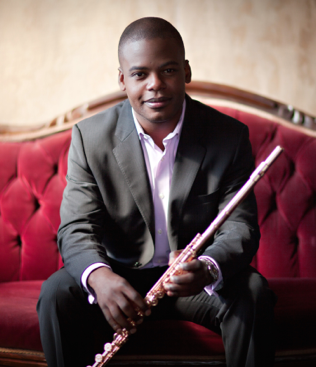 McGill received his Bachelor’s Degree in Flute Performance from The Curtis Institute of Music where he studied with Julius Baker and Jeffrey Khaner. He continued his studies with Mr. Baker at the Juilliard School, where he received a Masters of Music degree.